Sixteen years have passed since Rockfax published their first guide to Peak Bouldering by Allen Williams and Alan James way back in 1998. The second edition of Peak Bouldering, is written by Adrian Berry and Alan James who again have an encyclopedic knowledge of the area and it is likely to become the most popular Rockfax to date. At 544 pages this edition of Peak Bouldering is quite a weighty tomb. This impressive guide describes 3394 problems over 66 different crags which should be enough to last most people a life time! All the best Gritstone and Limestone venues have been included. I much prefer the more practical portrait layout used by Rockfax rather than the landscape layout of some other bouldering guides. A gallery of the many fantastic photos from the guide can be seen here on rockfax.com. The grading of boulder problems has been a contentious issue across the UK for a long time. In conversations Font grades are generally used for the hardest blocs certainly 7a and above, V grades are usually the choice at around V2-V6 whereas the english technical grades are most often quoted for the easier bouldering around 4a-5c. I also find that for the easiest climbs below Severe/4a descriptive route grades are usually used. Following colour coded circuits has long been the de rigueur approach to bouldering at Fontainebleau. The Rockfax team has developed has 60 colour coded circuits for Peak Bouldering and they organised try out days with local volunteers prior to publication to check the accuracy and value of the various circuits. (See the circuits PDF here) These graded circuits will be particularly attractive as an introduction to the various areas. Smart phone owners will be pleased to see that QR codes have been included on the mapping as it can make navigation much simpler. Just scan the code and a map will open on your smartphone to ease navigating from the parking to the climbing area. Wimberry, Tintwistle Knarr, Hobson Moor Quarry, New Mills Torrs, The Grinah Stones, Derwent, The Wool Packs, Wharncliffe, Bell Hagg, Rivelin, Bamford, Stanage, Burbage, Higgar Tor, Millstone, Owler Tor, Froggatt, Curbar, Baslow, Gardoms, Birchen, Stoney, Rubicon, Raven Tor, The Roaches, Ramshaw, Newstones and Baldstones, Gibb Tor, Pleasley Vale, Matlock Area, Cratcliffe, Robin Hood's Stride, Rowter Rocks, Harborough Rocks, Black Rocks, Dove Dale and Churnet Valley are all covered in great detail. However the inclusion of The Woolpacks has ruffled a few feathers but hopefully climbers will be respect the delicate nature of the rock and the environment at this unique destination. Both authors Adrian Berry and Alan James have extensive local knowledge of bouldering throughout The Peak District and their attention to detail shines throughout this comprehensively updated and extremely well illustrated edition. At £29.95 it is a small price to pay for a lifetimes worth of Peak Bouldering. 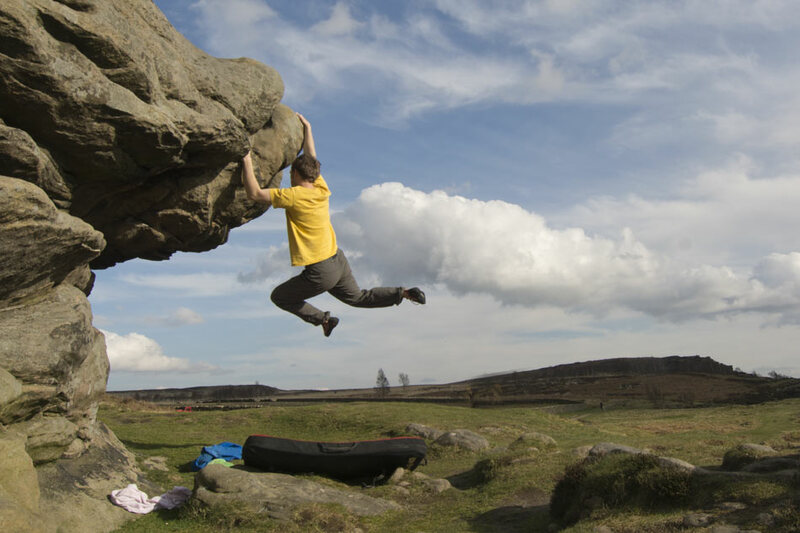 For an alternative view read what Matt Heason says about Peak Bouldering here on UK Climbing.